I’m certainly not an advocate for those couples who are glued to their phones and have to send a constant barrage of updates throughout the day: “Snacktime selfie! Miss u!” And I certainly don’t understand the people who actually talk on the phone like it’s the ’90s, when there isn’t an immediate purpose that renders text messaging too unreliable. But when you’re part of an established “us” or “we”, it can be tricky when your communication styles don’t match. First of all. Who wants the good morning text, really? Morning is when you’re rushing around, probably late (I know I am right now), can’t find your keys, and now you’re going to choose that time to remind her how cute and punctual you are? I mean, okay. If she’s like me, the good morning text will make her all smiley and happy and she’ll take what she can get, pausing to think of what a considerate guy you are, standing there texting her in your boxer shorts…. and great. Now she’s really late. 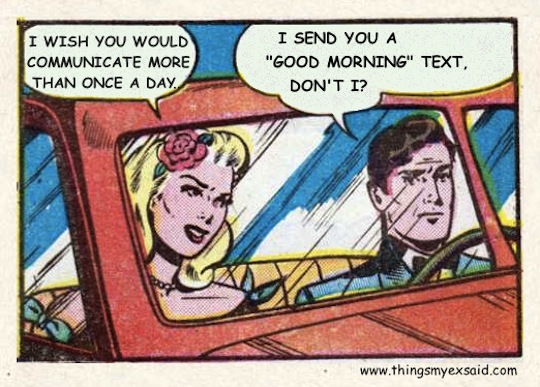 But to fire off a “good morning” text daily as though it’s as much of a chore as brushing your teeth? That just took all the romance out of my reheated yesterday’s coffee. Either she is extraordinarily insecure and can’t go 6 hours without hearing from you before she breaks down, or you are a robot. Effective communication is a lot like effective love making– it’s not just as simple as checking the oil, boys! Rehearsals are in full swing for TMXS: the Cabaret, which performs in Glasgow on May 12th and 16th. Stay tuned for more updates! Got a stupid ex? Want to see his or her quote up here in anonymous infamy? Submit your quote to ThingsMyExSaid! i think i love you!!!!!!!!!!!!!!!!!!!! !